"You enter the Imperial City, the heart of Tamriel, and the seat of power for his majesty, the Emperor Uriel Septim VII." The Imperial City is a city-state and the capital of the Empire, located in the center of the Imperial Province, the heart of Tamriel. The ruler is Emperor Uriel Septim VII. Its rivals are Daggerfall and Evermore. 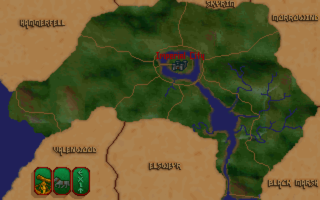 Typically, each city's citizens are the native race of that province. Although the Imperial Province doesn't have its own native race in Arena, the city's inhabitants use Redguard sprites and have random low-rank monster names. There are no random quests in the Imperial City.